Jeff Krulik and Jon Heyn revisit their head-bangin’ roots in their documentary Heavy Metal Picnic, which is now available on DVD through the film’s website for $15. Or buy the new film and the original Heavy Metal Picnic Parking Lot for just $25. Back in the 1980s, Maryland was the epicenter for hard rockin’ and even harder partyin’ moreso than anywhere else on Earth. And there was no bigger, more debauched, more deranged gathering at the time than the Full Moon Jamboree weekend farm party in the sleepy suburb of Potomac. Forget peace, love and understanding, the Full Moon was an unabashed, unending heavy metal concert planned by a couple of bored layabouts and one brazen entrepreneur looking for something exciting to do. The result was such a raucous event that it made the evening news and new laws had to be written so that nothing like it could ever happen again. Krulik and Heyn bolster the original videotaped footage of the party that was captured by attendee Rudy Childs by tracking down several of the party goers and musicians who attended the Full Moon. Most have settled into middle age comfortably and get a kick out of revisiting a monumental event from their past. Buy your copy of Heavy Metal Picnic today! 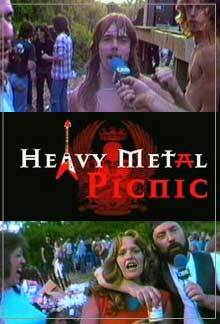 Read the original review of Heavy Metal Picnic on the Underground Film Journal.